very user-friendly and easy to learn. Auburn Electronics also offers electronic scoring displays that seamlessly integrate with our ProScore software. These displays complete the package, offering you the ultimate system for complete meet scoring, scorekeeping and records maintenance. 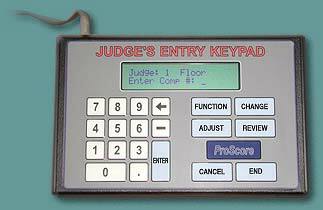 All scores are entered into ProScore with the Judge's Entry Keypads. The keypads feature touch-feedback buttons and a large 2-line, 20-character/line LCD display for easy readability. Best of all, the keypad's "intelligent" design makes learning very easy—judges are prompted throughout the entire process via the keypad's display. In a typical configuration, each judge on each event will have his/her own keypad (though all meet scores can be entered on a single keyboard if necessary, a configuration fully supported by ProScore software). Judges can enter, review, and even change previously entered scores from the keypad. The chief judge on each event can see each panel judge's score and then verify everything before saving the score. The system is highly flexible, too. Neutral deductions can also be entered. Scores for both vault attempts can be entered and ProScore will automatically take the better of the two scores or average both scores depending on the gymnasts level. In short, every aspect of scoring your meet is handled with ease, yet results are quick and accurate. Enhanced scoring display is enabled by the ProScore Mini-Alpha Scoreboard, a 2-line, 12 character-per-line alphanumeric scoreboard that displays the gymnast's number, name, and average score—all at once!—for a single event. The Mini-Alpha can also show the individual judges scores for open scoring. In addition, the Mini-Alpha Scoreboard can display messages up to eight lines long and can also display event/team/all-around standings. The Mini-Alpha Scoreboard is 11.5" high, 44.5" wide and weighs approximately 15 pounds. The actual display contains 24 5x7 dot-matrix LED segments (12 each line); character height is 4". Flash player. It's free, and you can get it HERE.